Patricia Farrington was born in White Plains, New York, but spent her childhood winters in Vermont. She decided to move out of the city in 1993, and started Honora Winery & Vineyard in a place where she had many fond memories: Vermont. Fast forward to Janice joining the Honora Winery family. Patty and Janice discussed a brewery and J’ville Brewery was born. She enjoys working with Janice to bring Southern Vermont quality products she is proud of. Janice Stuart started at Honora Winery & Vineyard, Inc. as an intern in 2009. With a degree in plant science she started with general grounds work, occasional vineyard and winery work. Once her internship was over, she signed on at Honora as Vineyard Manager, followed by Winemaker. Wearing multiple hats is a passion of Janice’s “I wouldn’t have it any other way”, Stuart said, “When Brewer was thrown into the mix, I was ecstatic. I love beer!” Holding three titles in her position, Janice goes through her day with a smile on her face. She is known as "the doer of awesome things"! Steve has lived in the Deerfield Valley for the last 20 years working for the local ski resorts. He started working for Honora/J'ville Brewery in September 2015. He is Assistant Brewer and also maintains the grounds at the vineyard. Look for him at the Brewer's Festivals. In 2012, the CEO of Honora Winery, Patty, approached Janice about potentially starting a brewery. They dreamed about how a brewery would run and what beers they would brew. In 2015 that dream became a reality! Janice has taken courses through the Siebel Institute, done some home brewing and had some hands on experience. the license for J'ville Brewery came through on March 17th 2015 and they got right to recipe development and brewing! J'ville specializes mainly in ales, with some experimental brews along the way. The tasting room has 16 oz cans, 32 oz crowlers and 32 oz growlers for purchase to date. There are 4 taps that rotate through the different types of beer, including some seasonal and limited brews. Take a look at the J'ville beer line-up and what is on tap today! In 2014, the J'ville team planted a small hop yard containing two varieties of hops: Cascade and Newport. Ninety plants of each variety was planted to see how hops would do on the same property as Honora's vineyard. One hop variety was chosen for the aroma and the other, bittering; both are doing really well. Over the last two years, the hops have been harvested in the fall. 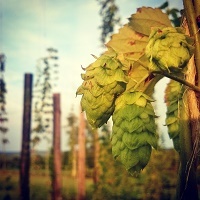 J'ville's estate hops are being used for the spring seasonal brew, Wet Hopped Ale. Using the hops in the wet form lends a grassy, earthy character that compliments the citrus and bitterness. Some of the hops are dried once they are harvested and are used in a Dubbel which is a Belgian Style Ale. The addition of J'ville estate hops in this brew add to the dried fruit character from the yeast. Our tasting room is shared with our Sister Company, Honora Winery. Serving both beer and wine, there is something at our tasting room for everyone! We are sure to give you the experience of a life time when visiting us. Interested in knowing what is going on in our tasting room? Sign up for our newsletter!